SynapzeINSTANT™ is a mobile app built specifically for instant credit card loyalty points redemption. 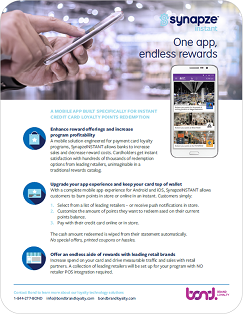 SynapzeINSTANT allows banks to increase sales and decrease reward costs, while cardholders get instant satisfaction with hundreds of thousands of redemption options from leading retailers, unimaginable in a traditional rewards catalog. Download your free data sheet and learn more about SynapzeINSTANT.